It’s been a long time since I felt the need to try a new game, but yesterday was the day! 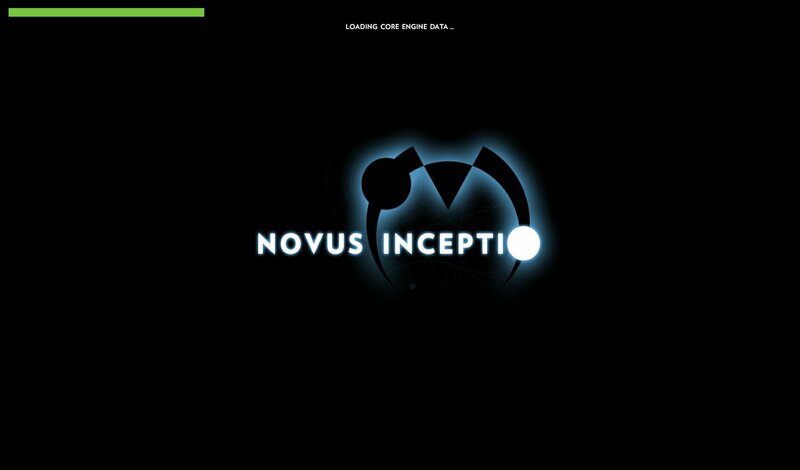 The game was Novus Inceptio. 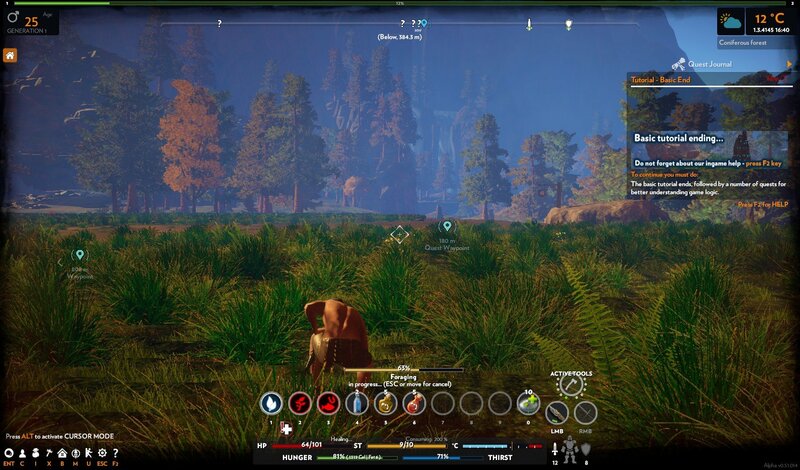 Now this is a game I had been looking at for many months already. 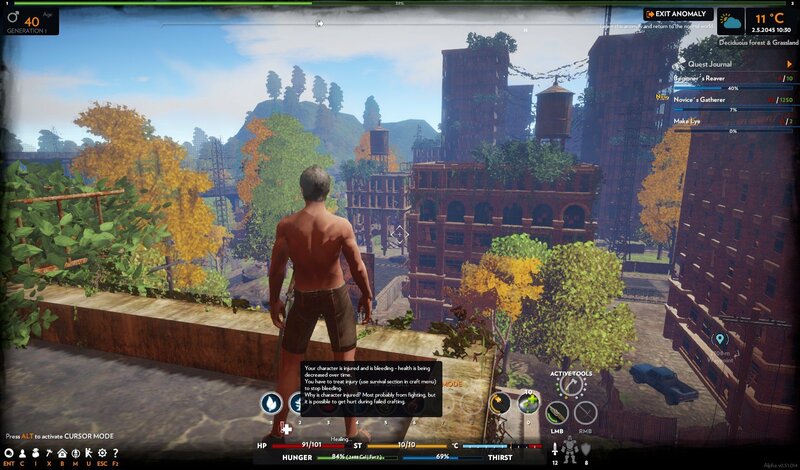 I’ve been playing Ark off and on and loved this survival game as an exploration game more than anything. Novus Inceptio seemed to be a game similar to this. The thing is though, the game is in early access state. It’s not a finished game. So I never really thought of buying it, but it was in my wishlist, just to keep an eye on it. When there was a sale for both Ark and Novus Inceptio, hubby got both of us an Ark pass for extra expansions and he also got me Novus Inceptio, for when I felt like playing it. It took me a while since then, but yesterday I tried! I had a bit of a rocky start getting the game logged in with a crash or two, but since those first two crashes, there hasn’t been any trouble in that department yet (and Steam tells me I’ve played over 5 hours). There were a few buggy moments in the game itself, but nothing too big or annoying so far. The creatures falling through the floor in one of the anomalies was the biggest bug I think. So you start in this lab kind of building (I wasn’t able to make a woman or edit my character in any way). The machines around you are healing machines. Though you don’t need them when you’ve just woken up, they do come in handy later when you manage to get yourself hurt through fighting creatures, falling, getting a heatstroke, etc. 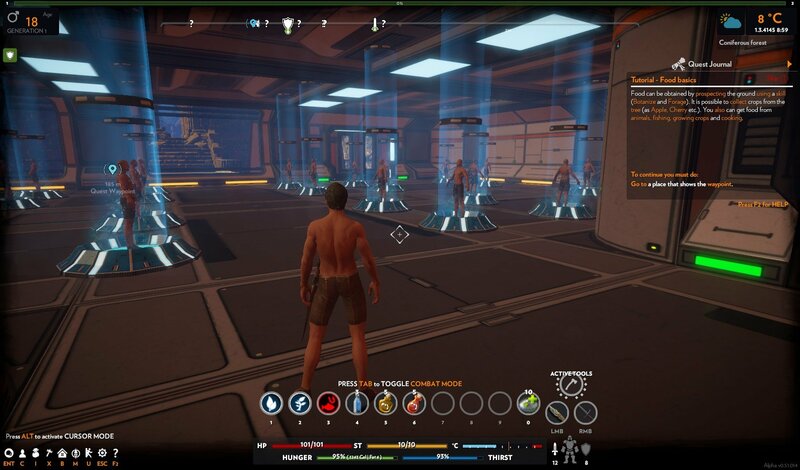 There is a second room in this place with a shop (haven’t spend much time there yet) and a cloning station. 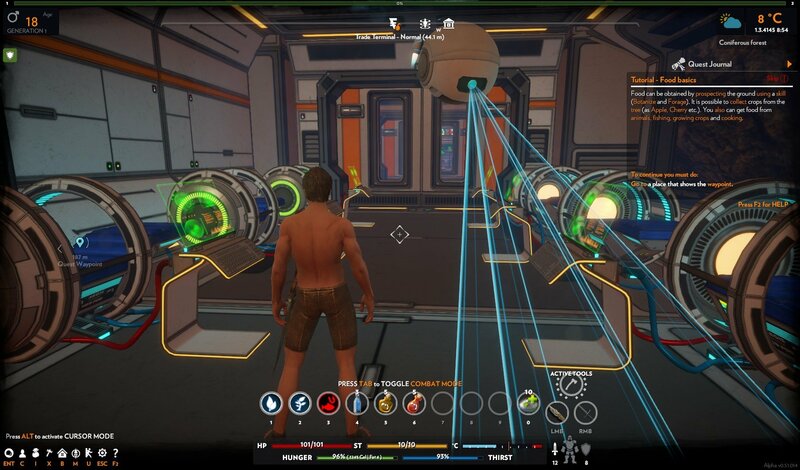 This is something I haven’t had to use yet, but from what I’ve read, basically once you die in game, your ever present shadow, the drone, will grab your stuff and you’ll have to drive it home to a cloning station to clone yourself and start fresh. I say fresh, you’ll get a new body, but the aging points you’ve build up stay and you’ll become a new generation, which also gives you points to spend on character upgrades. 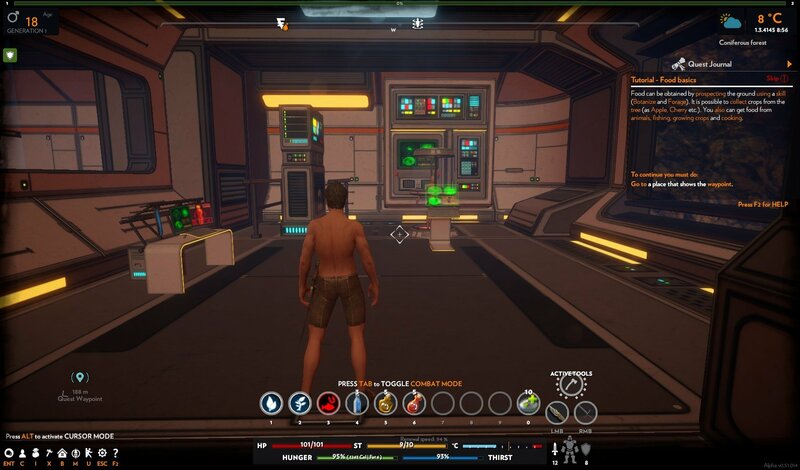 So the whole cloning process is something to get used to I think, but it is this game’s version of leveling. You age rather quickly ingame (I’m about 66 years old now). With every year, you get a point to spend in gathering/crafting. 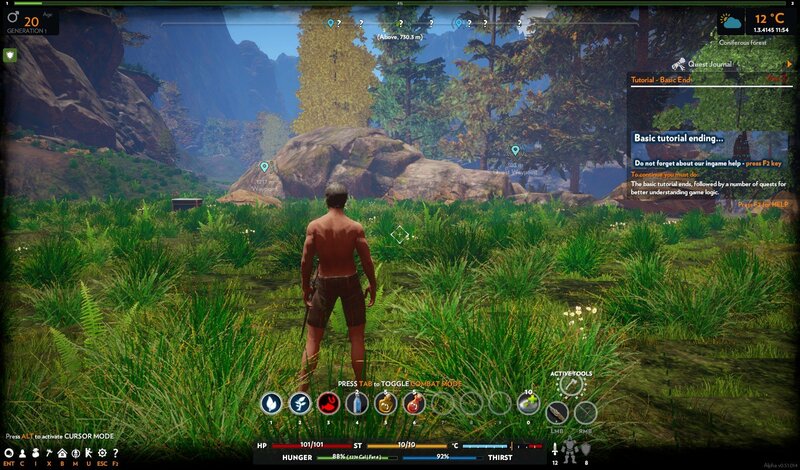 There are also tabs for armor/defense, but they aren’t active yet (Early Access and all). Once you die and clone yourself, you’ll receive a generation point (I guess), which you can put into things like extra bag weight, extra health, or extra stamina. Once you head out, you’ll notice your little safe haven sits inside some kind of cavern. I’ll honestly tell you it took me a couple of hours to find out it was actually part of a temple, which also had a cool topside! That was all my own fault, because once I headed out, I didn’t look back. 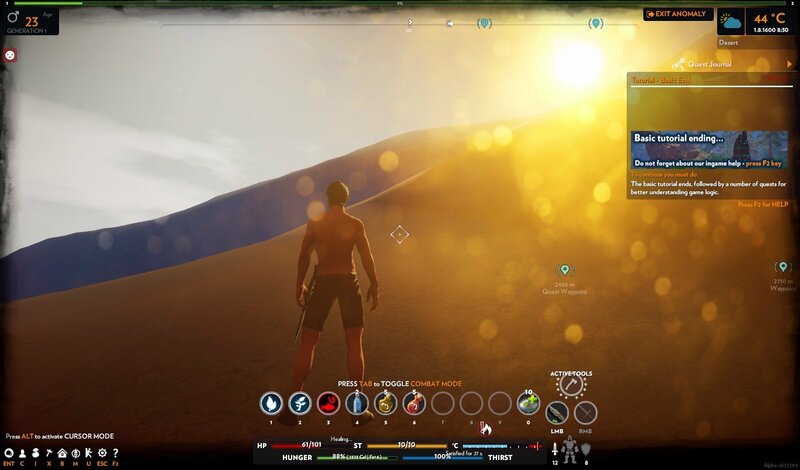 So in this game, as with Ark, you have to make sure you survive. That means enough food, enough water and keep an eye on diseases of all sorts that lower your health. You can gather simple items basically anywhere by foraging and botanizing. Your character just bends over and starts searching the ground for anything useful. You’ll pick up lots of seeds that way, but also things like fallen apples, cherries, strawberries, etc. The sort of terrain you’re on does matter while foraging. When you’re on rocky terrain, you won’t find seeds. Instead, you’ll find things like sand or rocks. Clay can be found while foraging in water. There is also crafting in this game. It took me a little while to take a serious look at it, because there was so much to learn at the start. Luckily, the game’s tutorial takes you through some of the basics. You will need plenty of different materials, but they aren’t too hard to gather. You do still need to process some of these materials into different ones to eventually get to things like cloth. 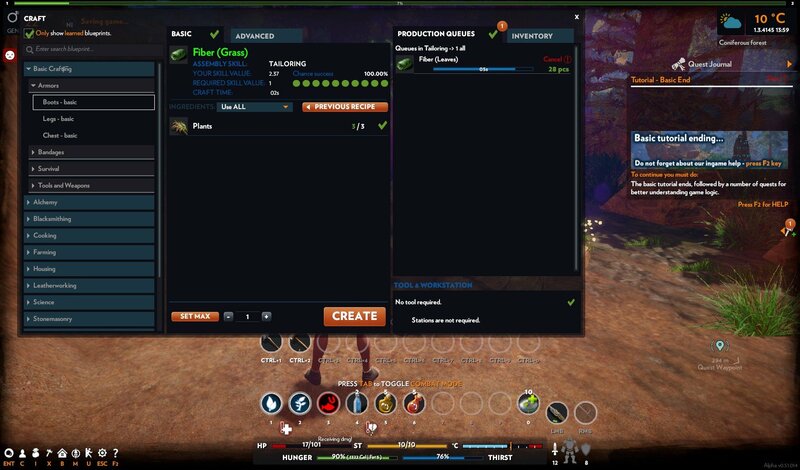 What I like here though, is that you can click on any missing item to go ‘deeper’ into the crafting to eventually get to the base item that you do have to process them into the thing you need. Being able to click through to the base item is much easier than having to search for each corresponding item yourself. So, efficiency! Gathering useful items is also done through fishing. 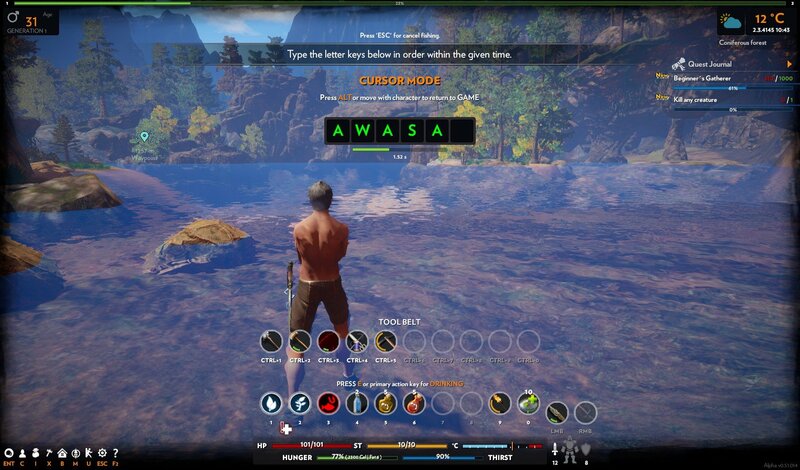 If you’ve ever done fishing in Black Desert Online, it basically works the same way. Once there’s a bit, you have to press Space at the right time and then typ in a letter combination to catch the fish and any other goodies your catch gives you. This sometimes includes crafting blueprints and anomaly papers that probably open up an anomaly for you to go through (I haven’t tried any of these papers yet). Speaking of anomalies! 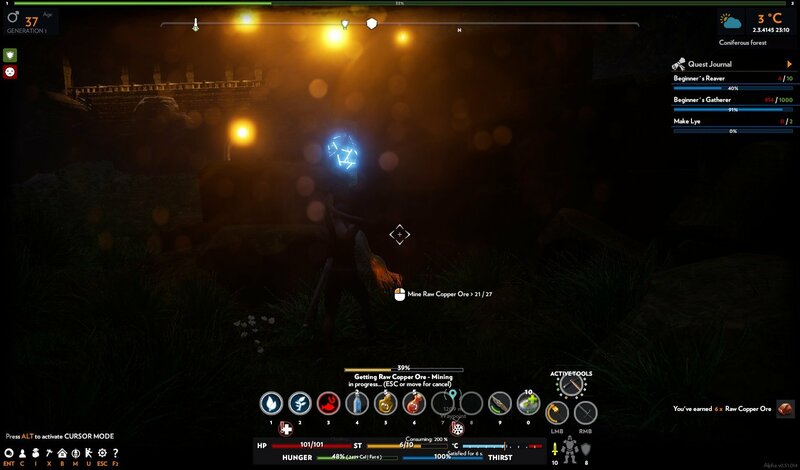 These are weird little glowy spawns throughout the map and when you get too close, you’ll step through them into a whole different world and time. So far, I’ve found two. There’s the desert one, which holds scorpions, heatstrokes and many precious ores. There’s also an abandoned city one, which houses wolfs, scrapped metals and electronics, bottles of wine, and even cans of coke. Plenty of things to discover outside of your basic map, which is also pretty big and I haven’t seen much of it yet. There are also building areas, where you can build your own house. I’ve been working on this and I will show you the results in a later post. So far, I enjoy the game. I guess that could be deduced from playing all morning and part of the afternoon, resulting in a late lunch after shutting down the game. I’ll play more today, so I figured I should get this post done first, before I lose track of time again! The game is in Early Access, so there are still some things missing. There was an update two days ago though, so I feel it’s safe to say they are still working on this (which isn’t always a given). 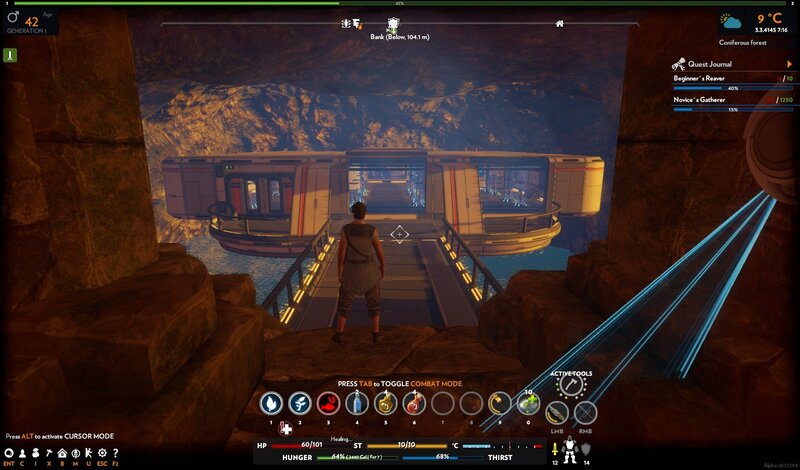 I am a little sad about not being able to put aging points in combat and defense, but I am an explorer by heart anyway, so I’ll just try to avoid fighting anything for now. I’ll have plenty to do through building, fishing, gathering, crafting, exploring, etc. etc. 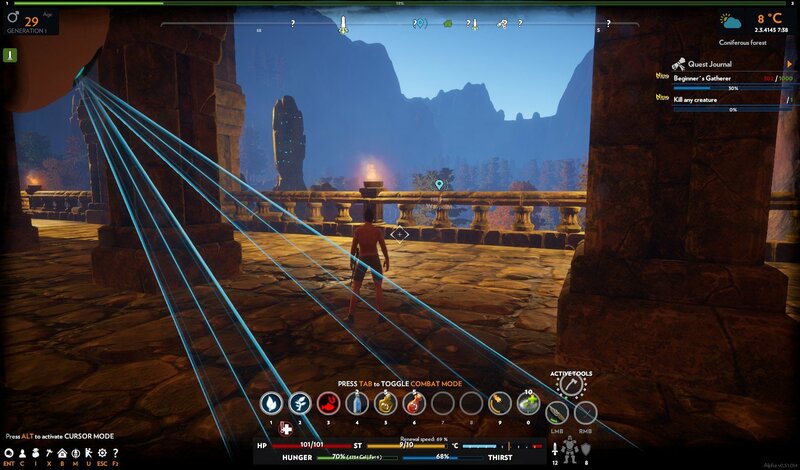 All in all, a nice game and a nice change of scenery from Ark for a while. Though once they release their new map later this year, we’ll probably head straight back to that game to check it out. But hey, as hubby says, you can play more than one game.